Celtic Woodland Titanium Ring : LOVE2HAVE in the UK! Our Celtic woodland titanium ring. When you think of any woodland, the first thing that comes to mind is walking amongst the trees with the birds twittering around you and the sound of the wind rustling in the leaves overhead. Peering up through the leaves and branches, you glimpse the blue sky and fluffy white clouds. 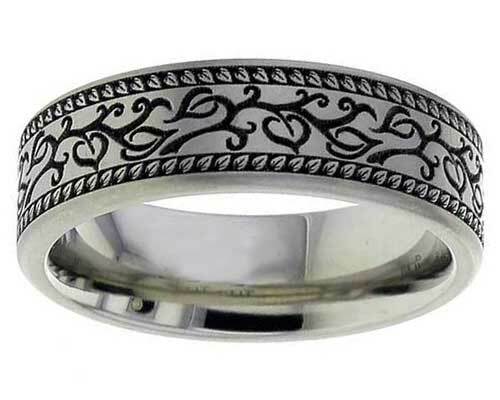 A tranquil scene that has been captured fantastically by the exterior engraved design of this titanium ring. The ring is a flat profile type that consists of two outer engraved bands that feature a small single repeated leaf shape that we think resembles Celtic style engravings. Centrally is a stylish leaf and branch cut out that is reminiscent of wood carving and again repeats right around the rings outer circumference. We think this design reflects a slight Celtic or spiritual quality and would appeal to anyone in tune with nature. Remember, the Celts had a deep affinity and understanding of the natural world. It comes in a 7mm width and is available in either a satin or a polished finish.